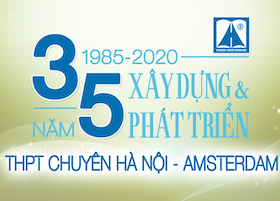 On March 10th, the chosen students in grade 11 and 12 represented Hanoi – Amsterdam High School to take part in a big contest broadcast on national television – Ring the Golden Bell – a knowledge contest for high school students. Although our contestants prepared themselves carefully, they still had to face an equal opponent, the HUS High School for Gifted Students. One hour before the broadcast time, our contestants, together with our teachers, arrived on time at the studio. Having finished the classes at school, we had to rush and had snacks there. The weather was cool and favorable for the students’ health. The Amser spirit was very high and we were trembling with excitement. Apart from the contestants, there were members of School Youth Union Committee, Cheering Team, journalists from the school’s website group, especially the teachers in Assisting Group. At the beginning of the show time, both teams hurriedly took shirts, hats and white boards given by the organizers. The pressure was relieved as the fan created a comfortable atmosphere and encouraged each contestant with words like: “Ams don’t give up”, “A-M-S Ams is the best.”After the introduction, the show started with Cheerleading and Teacher Performance. Our girls from the Cheering Team were brightly beautiful and dynamic in red, black and white outfits – three symbolic colors of Hanoi Amsterdam High School. They lightened the stage with the performances “My First Kiss”, “On The Floor” and so on. The opposite team also made everyone surprised with the unique idea of using lightsticks in their performance, which impressed the judges and made them the winner over our cheering team. Although they didn’t win, Hanoi-Amsterdam Cheering Team still succeeded in supporting our team wholeheartedly. The next performance was from 3,14 Gams, a potential band from Ams with a melodious song, together with the sweet voice of teacher Hai from HUS. The performance was so moved that the audience univocally sang along the harmonious music. There came the most important part when both teams walked out with the yellow color of HUS and the red color of Ams. Having prepared for everything, 2 MCs, Anh Duy and Minh Chau, got to know 100 students from two schools and started with the first question. Even though it was not so hard with Amsers, HUS Team lost 2 members in the first minutes, which was an advantage for us. Surprisingly, in the third question concerning Biology, both schools lost a lot of students, particularly 21 Amsers versus 19 HUSers. After the 7th question, the only one on the stage was No.183 Duong Anh Tung, an Amser from the Biology Class. There was no doubt of his answering the question, since it was a difficult one about Long Dien Huong, a perfume extracted from sperm whales. Would he be able to overcome question 10 and get one million dong when he was the only hope? We were so proud that Anh Tung gave three consecutive correct answers by himself in Mathematics, Geography and English. After receiving the prize, Tung offered his sincerest thanks to the audience – the ones who had supported every contestant unanimously. This was followed by a small game for the teachers. 5 teachers from each school were required to win a game to get the students back on stage. Our teachers successfully took 95 contestants back to the game. In the 13th question, there were only 10 students left, including 6 ones from HUS. Until the 15th question, 5 boys on stage must cope in the field of Chemistry. Each contestant had a different answer from the others’. Unfortunately, Amsterdam contestants had to stop since we had no correct answers. Even though we couldn’t move on to ring the bell, Amsers still cheered for HUSers fervently. We didn’t lose that day; everyone had tried their best to reach the bell. This was not only a contest but also an unforgettable memory for every students.